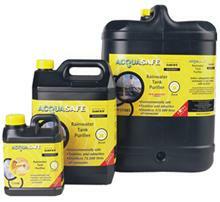 Davey Acquasafe is another product designed specifically for rainwater tank disinfection as it destroys virtually all bacteria and viruses leaving your rainwater clean enough to drink. It has been tested and endorsed in Australia for use in water treatment by the National Health & Medical Research Council. 1 litre of Acquasafe treats up to 15,000 litres of tankwater and is available in 3 sizes (1 litre, 5 litres and 25 litres) and can even be used as a supplement to Steriflo® UV disinfection.